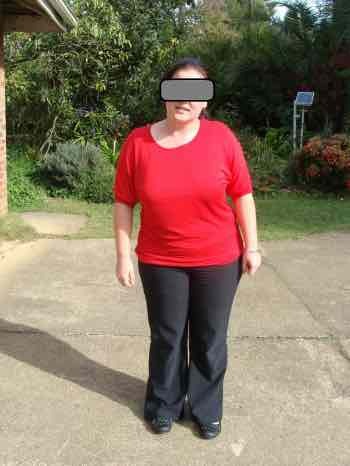 Antalgic posture is often the prelude to a nasty sciatica. Antalgic posture is often the prelude to a nasty sciatica. I don't think it's difficult to see that this lady has a distinct list to starboard. Acute low back pain, particularly if there is radiation down the leg, is very scary to the patient; and to be honest your chiropractor will be anxious too. You are on the verge of surgery. When there's a rupture of the intervertebral disc it threatens one of the nerves that lies close by. The body's response is to go into this functional scoliosis as it is known. It's a temporary affair, or should be provided the bulging disk is reduced. The chiropractic adjustment is just one way of reducing the bulge. It may if you are lucky return by itself and heal provided you stop long enough for the fibres of the annulus fibrosis to regain their integrity; otherwise it simply ruptures again. The surgeon would rather that you went under the knife to remove the offending fragment of the nucleus pulposis that has ruptured through the annulus fibrosis and is threatening one of the nerve roots that supplies the sciatic or femoral nerve; pain, tingling, numbness down your leg. In addition, if it affects the motor nerve there may be weakness of one or more of the muscles in your leg. Can you raise your big toe? This page was last updated by Dr Barrie Lewis on 24th December, 2018. The Slump test for sciatica is virtually always strongly positive; at home you can do a simplified version. Sitting in a kitchen chair, raise first one leg, and then the other parallel to the ground. Flexing the head onto your chest would worsen it often, but only in more serious cases. The valsalva manoever too is usually positive. Coughing and sneezing and bearing down on the toilet will increase the pain, and worsen the condition. Antalgic posture recommends you take exercising and massaging bed rest until you can comfortably stand upright. Make no mistake this is a serious problem. If you don't stop then surgery most likely awaits you. Then you will be forced to take a holiday of sorts; not the kind of your choosing. One person described it thus in our disturbing letters file. I was rear ended in my car and instantly had minor lower back pain. Notice that word minor; we see here how a slipped disc can progress if we don't follow the rules. Says he, I took some time off and went for chiropractic treatment; then I was able to return to work and enjoyed a good two months. Then I leaned over to play with my child and something happened in my lower back. I was unable to stand and when I did I had to put all my weight onto my right leg. I have a big lean to starboard. There are two kinds of slipped discs and they are very different; in the one case you lean towards the painful side, and the other in the opposite direction. In the above saga he never stated which side was painful, so we don't know whether it was the towards kind or the away from sort. As I said above they are quite different. This is something important to grasp. Are you leaning towards the painful side, or away from it? Both kinds take a minimum of six weeks to heal with chiropractic treatment although the pain may be gone in a few days. With nature knows best, and other forms of care, I'm not sure how long healing takes. Six weeks is my reckoning unless it occurred some time ago; then you're never sure. If you are leaning away from the painful side, then it's knows as the postero lateral disc; towards means it is a medial herniation. Clinically they behave quite differently. With chiropractic help, the medial disc often responds magically; within a few days you may be feeling almost normal. Alas, there's a sting in the tail. Postero medial disc herniations are far more likely to end up under the knife than lateral ones. How is that if it responds magically? 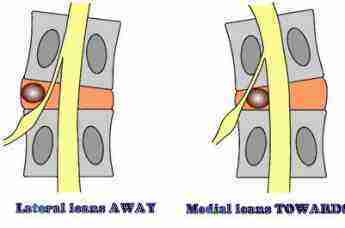 The chiropractic adjustment for reasons perhaps unknown is immediately effective with the medial disc herniation. The lateral kind takes much longer. As a result, those with a medial disc herniation often think their chiropractor has golden hands and they jump back into the deep end of life far too soon. They don't realise the importance of a daily exercise programme, and stop their rehabilitation. They start to sit and bend long before it's wise. If they are fitness freaks they are back in the gym. Often they cancel their next chiropractic appointment thinking they are healed. If they have small children they are bending and lifting and, bingo, the disc ruptures again before it has healed. 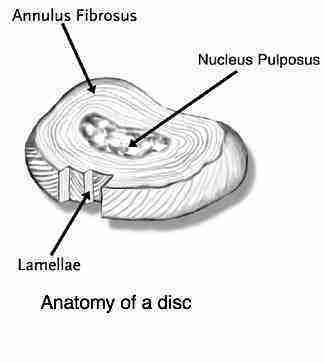 The lateral disc is another story; in some ways it's more honourable as the pain subsides slowly as the reduced disc heals. It's not the great deceiver that its medial sister is. Fewer posterior lateral disc herniations end up under the knife in comparison with its deceptive medial sister. Take great note whether you are leading towards or away from the pain. It is important. Backs can be mean. The woman in the picture at the top of this page has two slipped discs. That at L5 is on the right, whereas the herniation at L3 affects the femoral nerve and is on the left. When she goes into an antalgic posture it's particularly difficult deciding which is the offending level. An antalgic posture for me means massaging bed rest, whether you are leaning towards or away from the pain; with specific exercises done several times per hour. Remember that you are only one sneeze away from pain down the leg and a neurosurgical consultation. Take it seriously, no matter how difficult it is in your personal or business life; the alternative is too ghastly to contemplate. Don't ignore the fact that 600,000 Americans have back surgery every year. Of those who had surgery, only 26 percent ever returned to work; of those who elected for more conservative care, the figure was 67. Of those who opted for surgery 41 percent actually needed even more medication after the operation than prior to the procedure. Our advice is for every case of an antalgic posture to keep this in mind; see your chiropractor and go to bed until you can stand upright. This in itself is controversial; research shows prolonged bed rest doesn't help. You are on the verge of joining the surgical statistics. Will you be in the 26 percent who return to work, or the group nearly three times as large who never do? Wouldn't it rather make more sense to stop? That means stop sitting and bending and start doing gentle back exercise, and consult your chosen doctor, perhaps a chiropractor, but also another but not a surgeon. You're probably not be allowed to sit for a week or two, and that means staying at home. Give your lower back the prescribed six weeks to heal and decide to go on with the exercise for the rest of your life. Coupled with that is a determined decision that you will not lift the grand piano and play silly buggers; if your instincts tell you that it's too heavy to lift or push, then for heaven's sake listen. As the Dutch idiom states, those who will not hear, must feel. Are your ears stopped and you must feel? The first and most important of the slipped disc rules for anyone in an antalgic posture is that you must stop at least until you can stand upright, and probably several weeks longer; the fifty percent less pain rule kicks in. That's the dangerous time as the pain recedes faster than your back heals. A set back, or relapse awaits those who will not hear. An antalgic posture is a very serious sign.